Arangham has taken the responsibility of reviving this 10th century performance-art, unique to this temple. 7 GRACES... the many hues of Goddess Tara by Anita Ratnam for SUTRA, In the Second Flush series. 7 GRACES... the many hues of Goddess Tara by Anita Ratnam. ARAYER SEVAI - FROM TEMPLE TO THEATRE - a lec-dem organised by Emory University by Anita Ratnam. 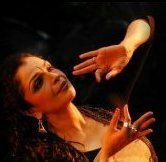 NEELAM, A world premiere TRIBUTE TO MS SUBBALAKSHMI at York University festival organized by Lata Pada and Sampradaya Dance. 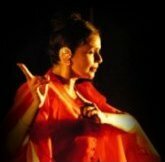 Anita Ratnam and Krithika Rajagopalan - The world premier of Red Earth and Pouring Rain, a tribute to the late poet A K Ramanujam at the international conference and festival organised by Natya Dance Theatre - THIRTIETH ANNIVERSARY SEASON with DANCE INDIA: CHOREOGRAPHING TRADITIONS.